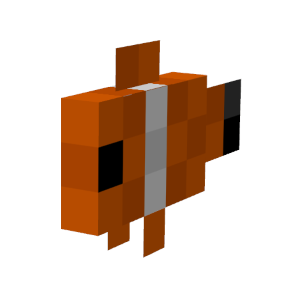 Fancy Fish is a Minecraft mod that introduces a number of exotic fish mobs and craftable items including fish food, fish bowls, fish tanks and a fishing net to capture and keep them as pets. 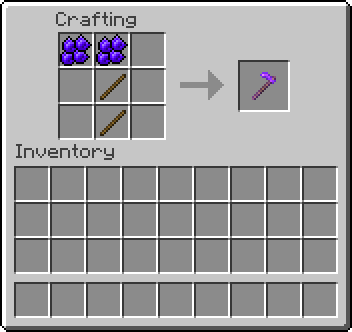 The mod also allows the player to craft new magical tools and weapons from harvested fish scales and teleports using pearls. This Mod is a work in﻿ progress. 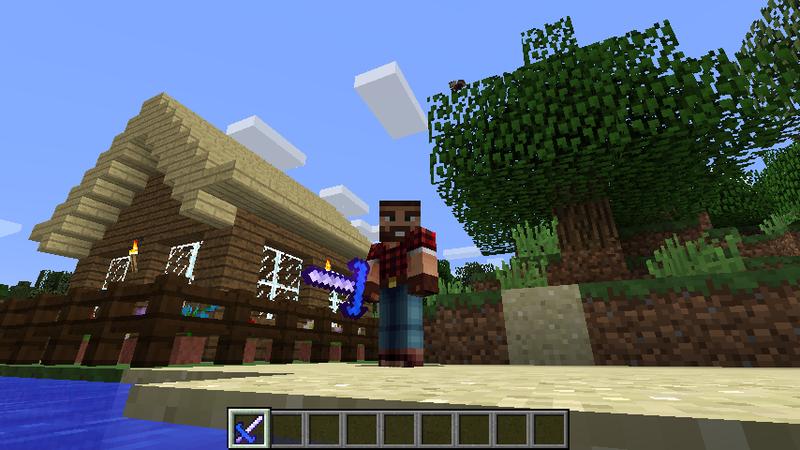 Try it out on test worlds before using it with your existing worlds. 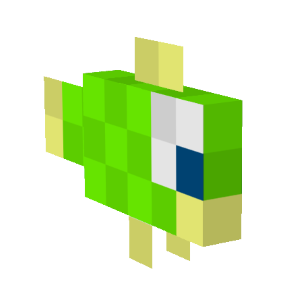 Fancy Fish Mod is compatible with versions 1.8 and 1.8.9 of Minecraft and Forge running either as a stand-alone client or as a dedicated server. You can find a version history and earlier versions of the mod in the Download page. For any questions, problems or suggestions, you can use the Contact page. This is an open source project available under the GNU Lesser General Public License v3.0 (LGPLv3). What is Fancy Fish Mod? 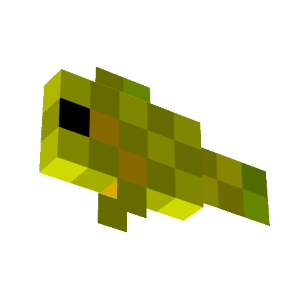 Fancy Fish is a Minecraft Mod that adds a number of exotic fish mobs and underwater plants that can be farmed or bred by the player. 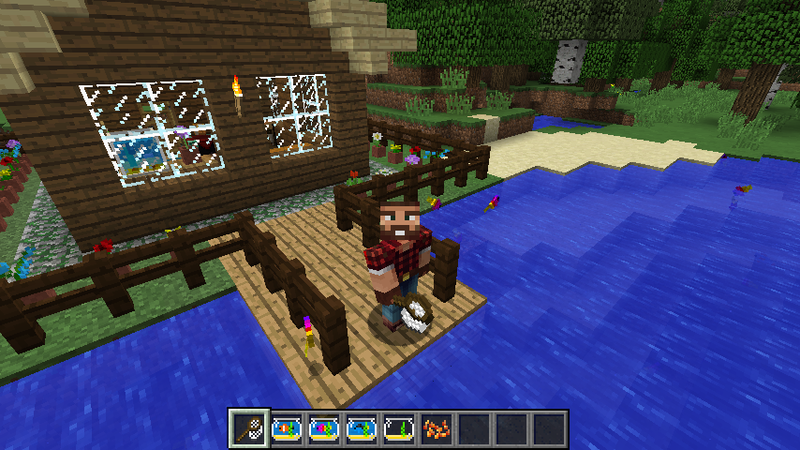 A number of craftable items are provided to help the player capture fish, including a fishing net and a fish bowl for carrying live fish around. 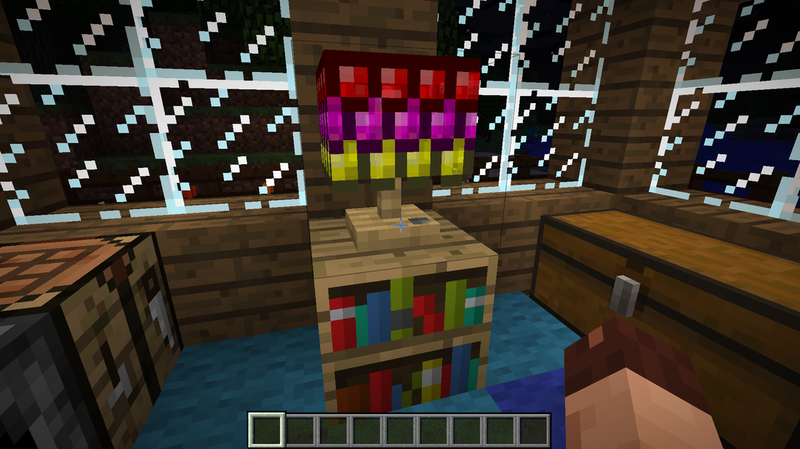 It is also possible to craft a decorative fish tank block that can be filled with a water bucket and captured fish. 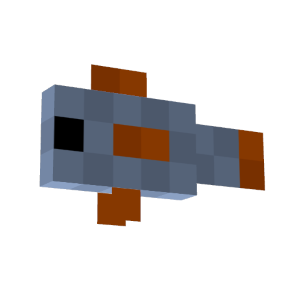 Fish can be harvested for scales that are used to craft a number of items, including fish scale armour and an enchanted fish scale sword. In-game screenshot with Fancy Fish Mod installed. 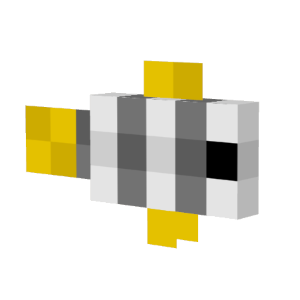 This mod adds the following exotic fish mobs: Clownfish, Regal Tang, Moorish Idol, Pufferfish, Royal Gramma, Yellow Tang, Damselfish, Blenny, Moonfish. 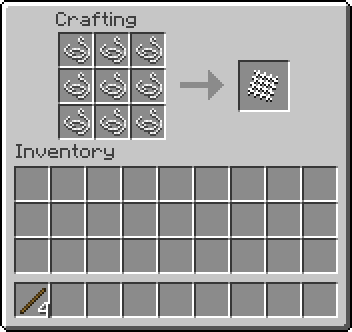 Fish can be attracted and fed with craftable fish food, which also serves to trigger breeding between fish of the same species. Fish can be captured alive using a Fishing Net and kept in portable Fish Bowls for later release in the wild or in a Fish Tank block. 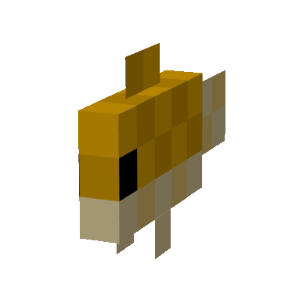 Alternatively, fish can be killed by attacking them or release them away for water, and harvested for their colourful scales that can be used for crafting various items. 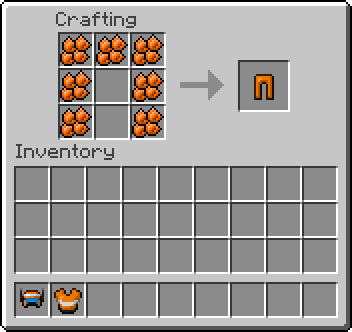 The mod generates patches of kelp blocks in ponds, rivers and oceans that are at least two blocks deep. Kelp grows gradually over time, much like sugar canes. Kelp releases bubbles, giving a more atmospheric feel when underwater. When kelp is harvested, fish hiding within it may be released. 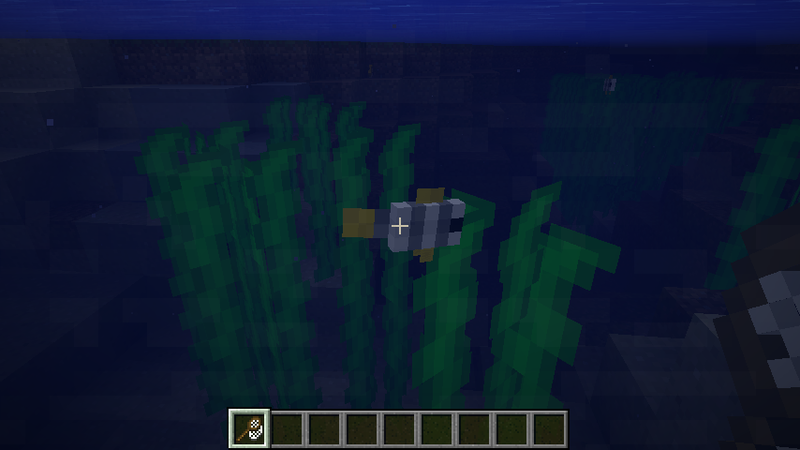 Kelp slows down any entities passing through it, including squids, fish and players. Clams can also be found dotted around the bottoms of rivers and oceans wherever there is sand, dirt or clay. Clams can be found open or closed, and the latter can be opened to occasionally reveal a pearl and XP to be collected by the player. 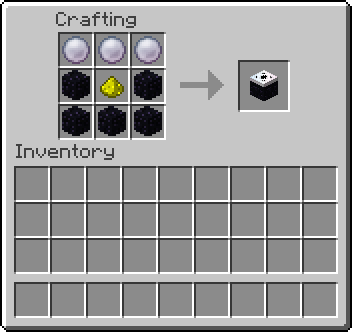 Pearls enable the crafting of teleport blocks. Hold fish food while in water to attract nearby fish. You can also feed it to fish to breed them. Fish food is crafted from wheat seeds and ink sacs. Crafting fish food from wheat seeds and ink sacs. Fishing nets allow you to capture fish swimming around in rivers and oceans. Fishing nets can be crafted from sticks and netting, and netting can in turn be crafted from string. Crafting a fishing net with sticks and netting. Crafting a fish bowl from glass panes and sand. Fish bowls allow you to keep captured fish alive for transportation and release in water or a fish tank. 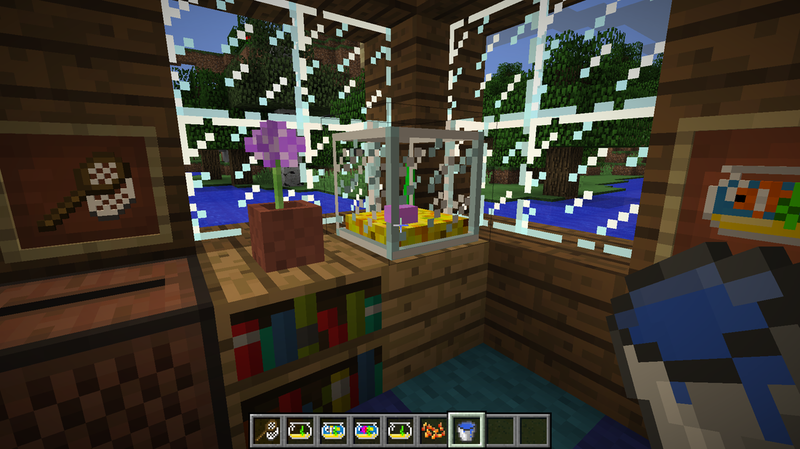 Fish bowls can be crafted with glass panes and sand. 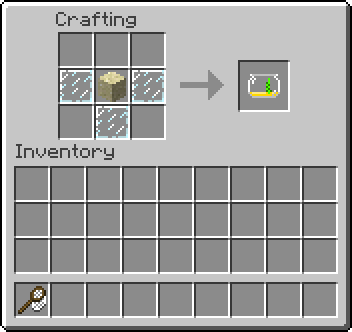 Use the fish bowl against a solid block or water to release the fish captured within it. When a fish is released in water, it will resume its swimming habits. If released on land on the other hand, the fish will bounce about until landing in water or until they die of asphyxiation within a few seconds of being released. The fish scale axe is a powerful enchanted tool that chops through tree logs very quickly. 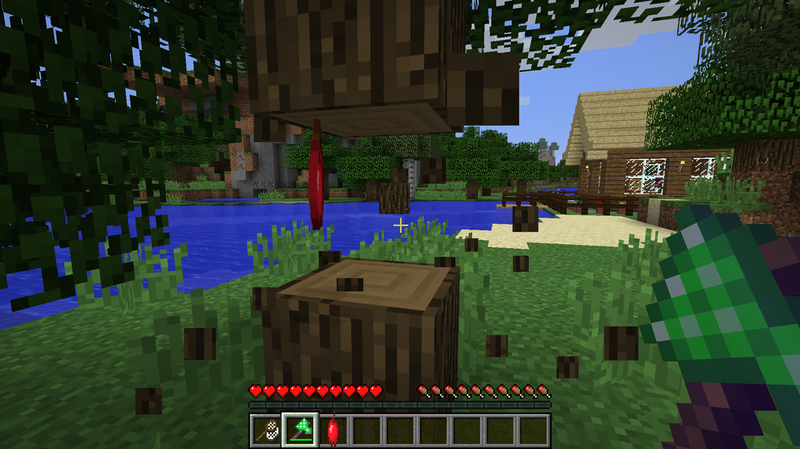 For each chopped trunk there is a 50% chance that the block will spawn an apple. Of these applies, there is a 10% possibility of getting a golden apple. 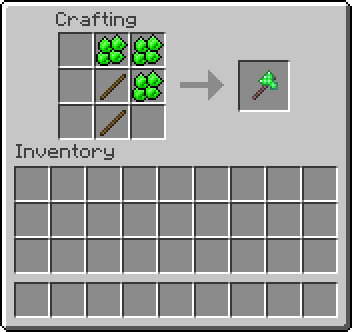 A fish scale axe can be crafted using sticks and green fish scales set in a pattern similar to vanilla axe tools. The fish scale hoe is an enchanted tool that spawns crop items with a 50% chance on each use. 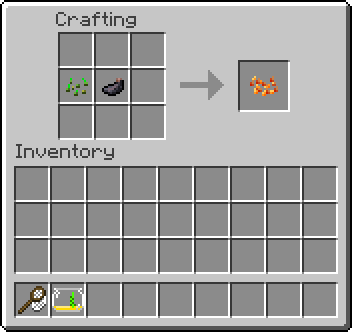 The spawned crop items can be wheat seeds, melon seeds, pumpkin seeds, potatoes or carrots. 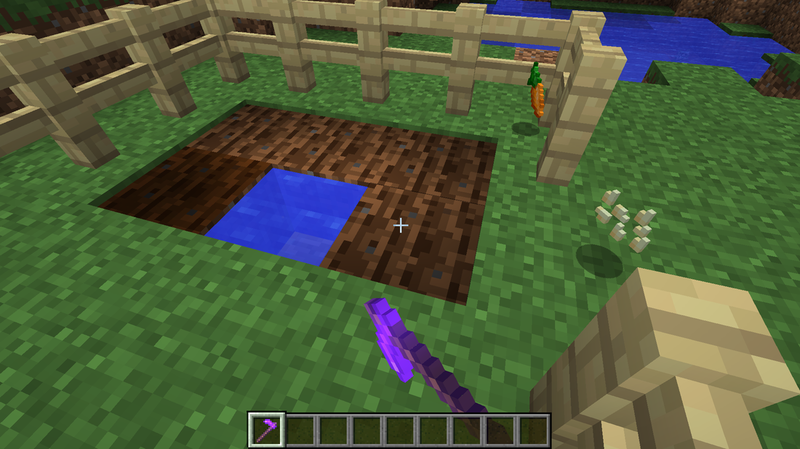 When a carrot is spawned, there is a 10% chance of spawning a golden carrot instead. A fish scale hoe can be crafted using sticks and indigo fish scales set in a pattern similar to vanilla hoe tools. 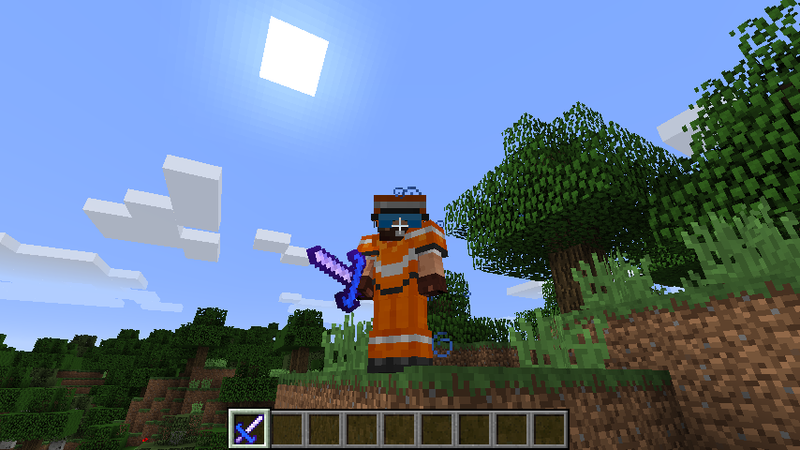 The fish scale sword is a very powerful and highly enchantable glowing sword that can be crafted from fish scales. 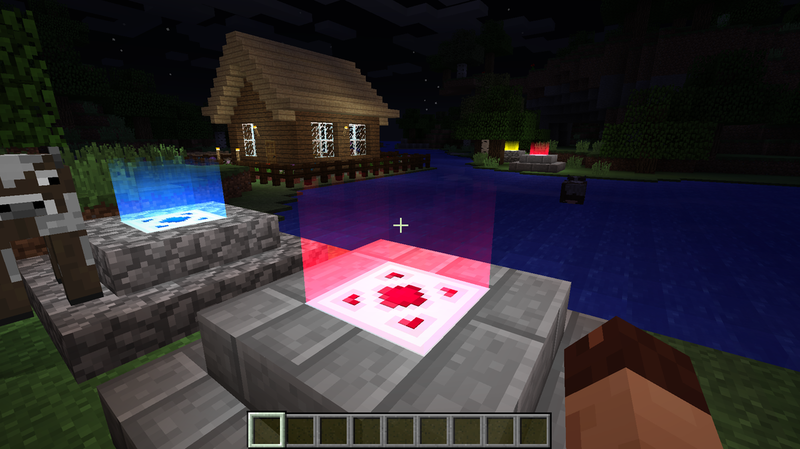 When attacking entities that are averse to water, damage is increased by one hit point and the wither potion effect is applied. The water-averse entities are blazes, ghasts, magma cubes, witches and ender dragons. Wielding the fish scale sword. 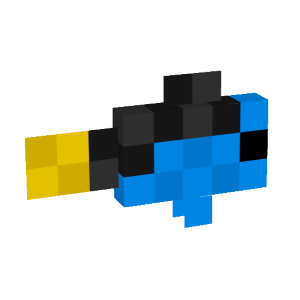 The fish scale sword can be crafted from white, blue and silver fish scales. Crafting a fish scale sword from harvested fish scales. 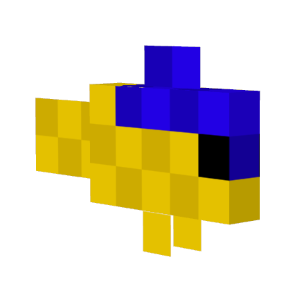 The fish scale armour is a medium level armour that allows the player to stay under water indefinitely, thanks to a water breathing potion effect bound to it. The armour can be crafted from orange, white and black fish scales and light blue stained glass pane. Crafting a fish scale helmet. Crafting a fish scale chest plate. 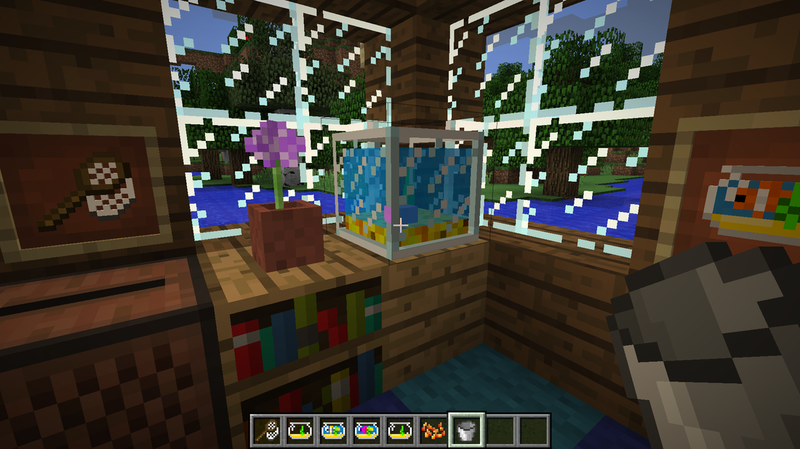 Fish tanks are decorative blocks that can be filled with a water bucket and host fish within it. Empty fish tank about to be filled. Fish tank filled with a water bucket. 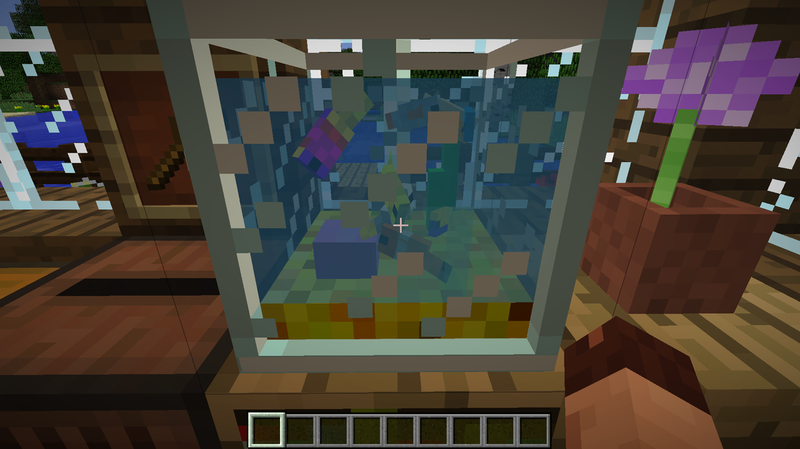 Fish can be transferred from fish bowls into a fish tank via a user interface that is accessed by right-clicking the fish tank block, provided it is filled with water. 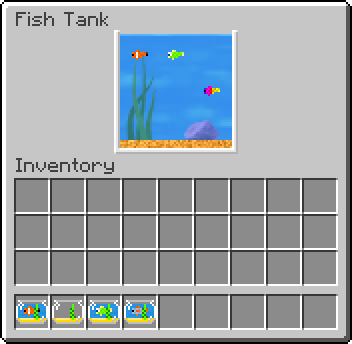 The tank interface shows a fish tank with a capacity of 9 fish slots at the top and the player's inventory underneath it. 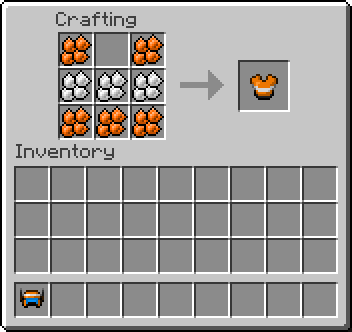 When captured fish are transferred to the tank, they are released into the tank and an empty fish bowl is returned to the player's inventory. Fish placed within the tank can be seen swimming around within it. If the fish tank is drained of water via an empty bucket or it is destroyed, any contained fish will be released and will exhibit their flopping behaviour until caught, landing in water or death by asphyxiation. Fish tanks are crafted using glass panes, sand and kelp. A lamp shade is a decorative block that also acts as a light source. It can be switched on and off by interacting with it using the right mouse button. 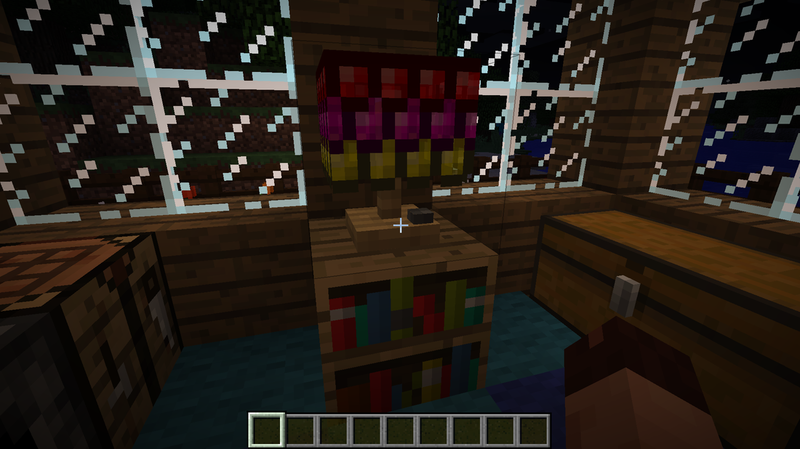 ​ A lamp shade can be crafted from a torch, oak wood slab, and royal gramma fish scales (red, purple and yellow). Teleport blocks allow the player and other entities to instantly travel from one point to another within the same dimension. Teleports are powered and configured by placing fish scales within their core, accessible by right-clicking on them. Once activated by the placement of a fish scale, the teleport will light up and glow with the colour corresponding to the scale. 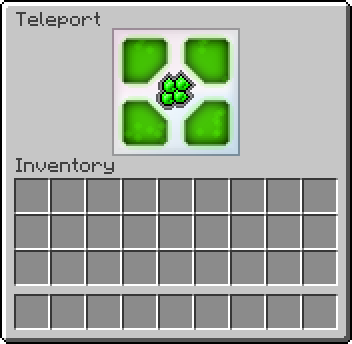 To use a teleport, step in the middle of one and if it is active and a destination teleport is available, you will be immediately transferred there. 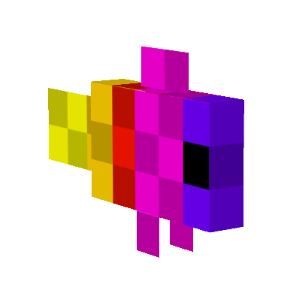 Teleports containing a fish scale of the same colour form a teleportation ring, in which a player or entity can travel from one to the next in a cyclic fashion, returning to the first when using the last one in the ring. 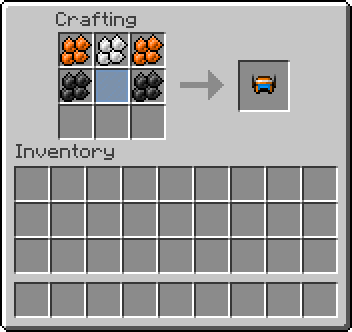 Minecraft rails can also be terminated by teleports, allowing mine carts to jump from one end of a railway to the start of another one some distance away. 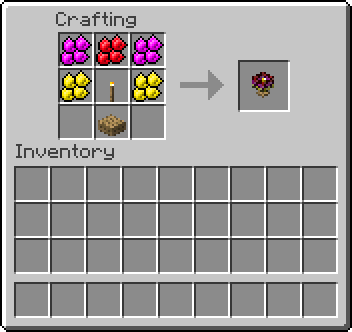 Teleports can be crafted using pearls, glowstone dust and obsidian. 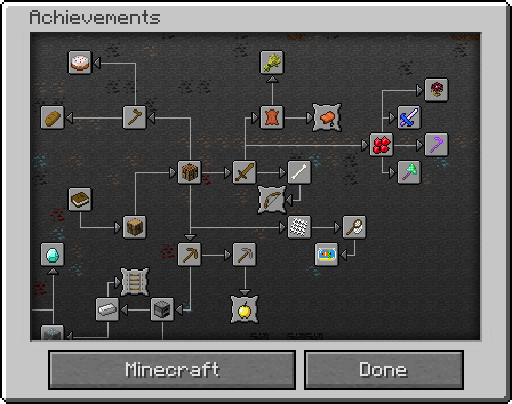 The mod also adds several new achievements related to fishing and crafting from fish scales. Can you get them all?